All the stocks of the libraries of the University Frankfurt are accessible via the Frankfurt Portal (former online catalogue.) There are various types of media from current to early publication years, specialist literature or novels, microfilms, DVDs or online editions, dissertations, sheet music, journals and much more. Use search terms taken from the title and combine them with the surname of the author. Under «Books and more» each hit is shown giving information about where and how the title is accessible. The name of the library is linked to the contact details of the library respectively. In the online catalogue there are digitized catalogue cards of the University library (before 1986). Early stocks of the faculty libraries were often recorded on original catalogue cards and stored in the library catalogue as well. 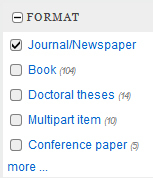 Use search terms from the title of the journal. Omit the date or year dates. When you search in the Frankfurt portal you can filter your search according to type of publication. Each library indicates which volumes are available under «Holding». 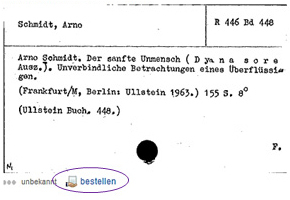 Electronic journals are also searchable in the Frankfurt Portal. The full-text link enhances your search. Please note that not all the volumes have been licensed. Usually access to the full text is only possible on the University site. Students and members of staff however have access to electronic resources off-site. Printed and electronic journals can only be found simultaneously via the Frankfurt Portal whilst the Electronic Journals Database(EZB) only records electronic editions. Do you know the title of the journal or the book in which the article has been published? If so, then it is best to look in the Frankfurt Portal directly for the journal or book. Via «Articles and more» in the Frankfurt Portal you will find article literature pertaining to your search literature - where possible with full-text access. Furthermore, the University Library provides access to a large number of databases. Many function as bibliographies and help to search for independently produced literature (articles). There are also a number of encyclopedias, biographical reference books, dictionaries, editions of important authors, newspaper archives and much more. Take a look at the list of popular reference works. The list of data bases on our website shows which databases are already searched in «Articles and more». Just to remind: access is usually on site only. Students and staff members of the University have access off-site. For early articles take a look at the printed editions of bibliographic reference works. Ask a member of staff at the information desk where the bibliographies of the various subjects are located. Once you have found out the source of the article, look up the title of the journal or book in the library catalogue to find out where the article has been published. Enter search terms which describe your topic in the Frankfurt Portal. Use synonyms or foreign words as well. The Frankfurt Portal searches indexes and phonetically-sounding similar terms as well as terms with a similar root, the number of hits can be very extensive. In the complete record of each title there will be keywords which may help you further. Tick a word and go to the magnifying glass to activate a further search directly. Also, use the possibility to restrict your number of hits via the search filter on the left e.g. subject area, publication type or even publication year. You can also use the RVK notation in the complete record to search for more literature. Click on one of the listed notations which appear next to the title. You will get a list of all the titles and related hits, which are also covered by this notation. The information button next to the notation explains the meaning and makes selection easier. Please note that the Central Library's card catalogue arranged by subject comprises literature until 1994. The online keyword index appears as from 1995. The catalogues are mainly in the lobby at the Central Library. Use the keyword register in the bright red catalogues for simple access or take a look at the cards with the names of people. Ask at the Information Desk for more ways to search these catalogues. We have an overview of libraries and Universities in Frankfurt ( e.g. The Public Library or the German National Library) on our website under Standorte. Refer to the Karlsruher Virtual Catalogue or the Journals database(ZDB) for a Germany-wide search. Useful links are given on our website under Bibliothek online/national catalogues. More information is available at our information desk on interlibrary loan beyond Frankfurt via the HeBIS Portal. A list of tours and training at the libraries of the University of Frankfurt is here. Your contact to the University Library Frankfurt.